When you start looking at the fantastic mountain bike world, the first hard thing is to choose the "right" bicycle, a quite difficult choice given the incredible offer available today in terms of different types and price ranges. It's a common situation and the feeling of initial disorientation is unavoidable. I've also gone through this, and learning from my mistakes I hope to help you make more informed choices. I discovered mountain biking at a particular time in my life: 30 years (maybe a little more), a few pounds to lose (maybe a little more ...), a baby coming, an integralist motorcyclist's past considering cyclists as a kind of self-moving rear-reflectors with a strong - and inexplicable - propension to masochism. This is a "no-choice choice", because it's the first thing that comes to mind, but I would advise against this choice anyway, first because we will hardly be able to deal with real off-road with one of those old bikes (and this could put us in danger too), and secondly, because it will probably force us to spend a lot of money to do maintenance on it, which will end up being not really worthy. Obviously, I've been through all this and I was amazed to remember my '91 bicycle being much better than it really was; the "revival experience" lasted about six months in which I had to replace the chain, brakes, saddle, handlebar... when a bad fall stopped me while I was planning to fit a modern damped fork to the prehistoric frame. It sounded like a very good idea ...even if my mechanic looked at me compassionately when I talked to him about my projects. 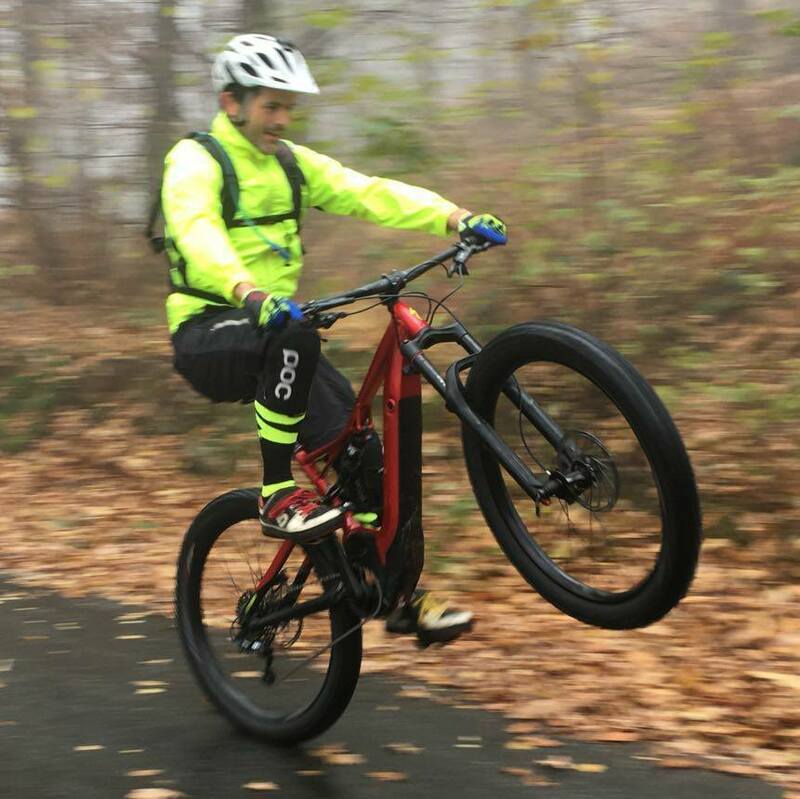 MTB with suspension forks and rigid frames (Hardtail). The price, in fact, is a key factor for those who are at their first experience, and can not really predict how and how much they'll use their mtb after purchasing it. Spending too little can lead to the purchase of a low-quality bike that can easily dampen our passion. Avoid mechanical disc brakes, which has the same braking power of a good V-brakes but causing many more problems and unnecessarily heavy. Prefer hydraulic disc brakes, available not at all price points. Avoid excessive weight, it is not necessary to pedal a featherweight, but a front above 14 kg is certainly too heavy. Avoid too soft saddles, it is far better to invest in a quality shortsuit that in a super soft and padded saddle that will hinder the efficiency of your pedal action. Avoid too sophisticated and technological transmissions, very often the transmission is the only thing that you consider when purchasing the first bike ... but the truth is that a low-mid range gearshift works perfectly and will last longer than a more expensive one, whose benefits are relevant only to those who make a really though use of the bike. Avoid bicycles with three chainrings (pedal-mounted gears), unless you need to cover long distances on paved roads, where you may need a very long transmission ratio. Avoid bicycles with a single chainring, which are in fashion nowadays, but they can be really hard to pedal for beginners. Two chainrings are the ideal compromise to move anywhere without doing too much effort and at the right weight. At the rear, the cassette (wheel-mounted gears) can be with 10-speeds (very popular), 11-speeds (more recent and expensive) or even 9-speeds, older but still functional. Avoid models with 8-speeds (or less), they are economical, old, and unnecessarily heavy standards. Prefer, if you can, forks using air as the elastic element, because they allow you to better fit the bike to your weight. Normally hardtails have 100mm travel forks, (80mm for bikes with 29" wheels - we'll talk about it later) "Spring forks" with less than 100mm travel are cheap, rather heavy and in most cases inadequate ... if you can, avoid them. Avoid 26" hardtail mtbs, these bikes in the right hands still have excellent performance, but for beginners a larger 29 "wheels hardtail offers a significantly higher level of comfort, making them the best choice. There are also 27.5 "MTBs but in the hardtail category, the 29" are still preferable for greater comfort, at least for those who are taller than 170cm; below 170cm, in fact, a 27.5 "can be a better choice. In any case, about the size, let yourself be advised by an experienced and serious seller, who will most likely not sell you a too cheap bike; he will also be able to help you in the delicate initial setup phase (driving position), which is very important for those who start cycling, in order to avoid inflammation and other pain due to the (always strong) initial effort. Warning! Choosing a hardtail is not obligatory, and if you can afford it, a full-suspended will offer you more comfort and security... Full-suspended is a really recommend choice for those who suffer from back pain or similar issues. Pedals, there are no technical reasons for not starting using clipless pedals, although almost no one makes this choice for the obvious (unjustified) fear of not being able to get away when needed. For those who have chosen the flat platform pedals, I would suggest to avoid initially the most expensive ones in favor of plastic models that do not have metal pins protruding from the surface to improve the tightness of the shoes on it. This is because in some cases the constraint created by those pins can be so strong in the angular direction (even more than the clips pedals) to lead to pedaling incorrectly causing inflammation to the knees. I will finish up with a non-technical recommendation, but no less important: your first MTB must be at least as beautiful as to make you want to use it as much as possible!! Don't be too rational, passion never Is! Good luck and good pedaling ! !